Chocolate, there are just some things we can't live without! To quench your brownie batter craving (or chocolate craving, or craving for something sweet and decadent), I have put together the below guilt-free recipe that you can whip up in just 10 minutes. Use this recipe as a foundation to build upon and create your own sweet treats that satisfy your personal taste and cravings. Just make sure that if you add ingredients to this recipe, they are in line with your health & fitness goals! Warm-up:Do jumping jacks for 1-2 minutes. Burpee Challenge: Perform 100 reps of BURPEES!! My tip is to do 10 reps at-a-time until you reach 100 reps. The key to this workout is to take it one move at-a-time. 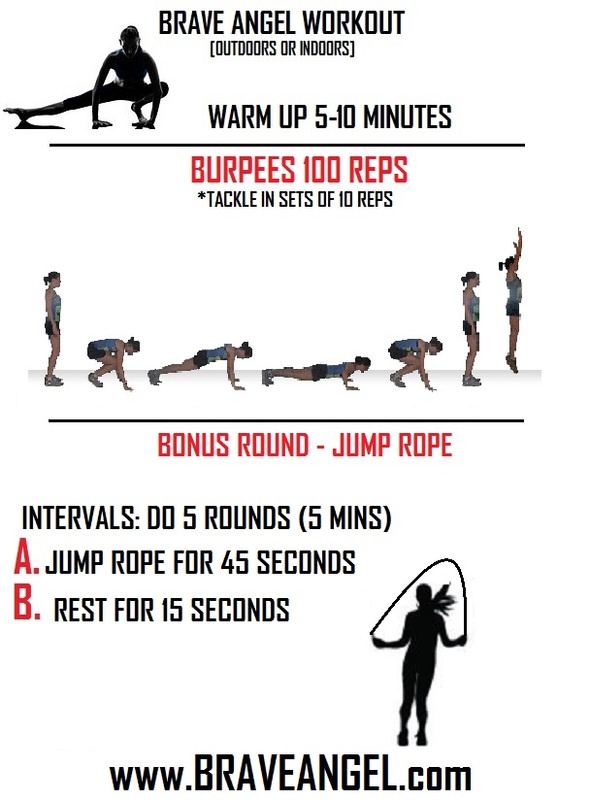 Tackle each burpee with passion, and tackle in sets of 10 reps at-a-time, until you get to 100 reps. Then move onto the bonus round if you dare! Your arms, bum, abs & heart rate will be on fire when you are done! Bonus round:Grab a jump rope and jump rope for 5 intervals of 45 seconds jumping rope and 15 seconds rest (5 minutes total). Pin below "Workout Roadie" to your Pinterest board so that you can take this workout on the road with you to the gym or at-home! Also, take a look at the newest additions to our Brave Angel Motivational Workout Clothing Line!